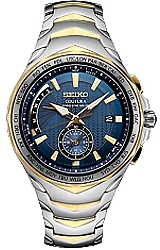 The Seiko Coutura Solar Radio Sync Dual Time Watch is an extraordinarily handsome pilot's watch. Radio Sync assures you're always exactly on time, solar powered men;s you'll never replace a battery and a sapphire crystal keeps the watch handsome forever! 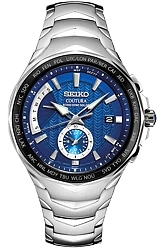 The watch features Dual Time Display PLUS world time in 25 time zones at the tough of a button.